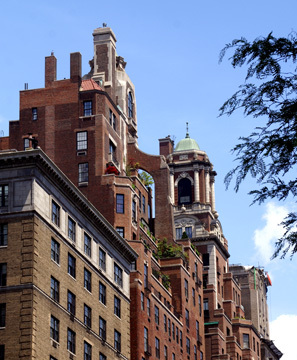 One of the city's finest apartment buildings, 770 Park Avenue is a Georgian-style confection designed by Rosario Candela, widely regarded as the foremost architect of grand apartment buildings in the city. was a seventeen-story Georgian building, housing forty families in an H-shaped plan that maximized light and air for each apartment on a deep site. Candela created a complex of interlock of duplex and simplex apartments so that no unit was denied a street orientation. Though the massing was simple, the complex window rhythms suggesting the plan enlivened the composition as did the terraced setbacks rising to a domed penthouse. 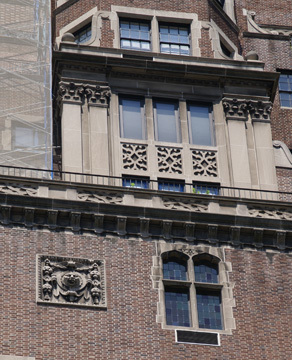 "The elegance of the building's massing and detail was carried to the interior, which included Modern Classical lobbies and hallways decorated by Mrs. George Tuckerman Draper - who, as Dorothy Draper, would become one of the most successful decorators of the 1930's and 1940's - as well as to the design of the individual apartments, many of which were duplex units" for example, most double-hung windows in the libraries and living and dining rooms of apartments were brought to within ten inches of the floor and protected by ornamental iron balcony rails to suggest the typical condition of the piano nobile of an elegant townhouse. "Candela's smaller English Renaissance apartment house at 778 Park Avenue at the northwest corner of Seventy-third street, built in 1929-31, entered into a remarkably coherent and lively dialogue with his earlier work at 770 Park Avenue; the pair of towered buildings formed a monumental gateway west toward Central Park." which rose to twelve stories and then broke up into tiers of setbacks that were topped with a lanternlike penthouse tower. A year later, 778 created a similar silhouette on the northwest corner, and together, the pair framed the street like important monuments. The rooflines could be seen from far way, and they expressed the essence of these buildings elegantly, for they looked like clusters of houses or small European villages." adding rhythms that suggested the life within." Born in Sicily, Candela came to the United States in 1909 and graduated from the Columbia School of Architecture in 1915. His other famous buildings include 834 and 960 Fifth Avenue, 720, 740, 775 and 778 Park Avenue, and 19 East 72nd Street, all considered among the most glamorous addresses in the city.